What is the fifth generation of computer? How many generations of computers are there? What is the second generation of computers? What is the first generation of computers? Who was the inventor of second generation of computer? What was the first computer used for? What are the features of the fifth generation of computers? What is the generation of the computer? What are the generations of computers? What is the fourth generation of computer? What is progress 4 GL? What is 5th generation language? What is the generation of programming language? What is the second generation of programming language? What is a third generation language? Why high level language is machine independent? What is the meaning of machine independent? What is low level and high level language? What is the first generation of computer language? What is vacuum tubes in first generation computers? What are the components of a computer? I’d included this question in sample test for the participants of eCourse and surprisingly found that many students did the very mistake. Vacuum tubes, transistors, ICs, LSI & VLSI chips are used as switching components or memory and processing devices. In first generation computers, the operating instructions or programs were specifically built for the task for which computer was manufactured. The Machine language was the only way to tell these machines to perform the operations. There was great difficulty to program these computers and more when there were some malfunctions. Since when the first generation computers started? There are two different views regarding from when the first generation began. Some believe that it started from 1946 when the first computer using valve – ENIAC – was developed. Do you remember how many vacuum tubes ENIAC used? Some others argue that we should consider EDSAC as the first computer of first generation because it is the first computer to use stored procedure – a true computer in modern sense. ENIAC was just a calculator! 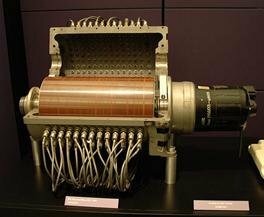 If you consider EDSAC is the first computer of first generation, then 1949 should be the starting of first generation. Note: There is no fixed and generally agreed date for any of the generations. In fact the computers are classified into different generations based on the switching component and technology rather than time slots. Consider the dates as tentative. More generally the duration of first generation computers is 1946 to 1954. The vacuum tube was an extremely important step in the advancement of computers. 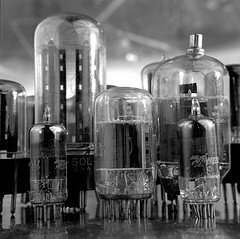 Vacuum tubes were invented the same time the light bulb was invented by Thomas Edison and worked very similar to light bulbs. Its purpose was to act like an amplifier and a switch. Without any moving parts, vacuum tubes could take very weak signals and make the signal stronger (amplify it).Vacuum tubes could also stop and start the flow of electricity instantly (switch).These two properties made the ENIAC computer possible. In 904, John Ambrose Fleming invented the first practical electron tube called the ‘FlemingValve’. Feming invents the vacuum tube diode. In 1906, Lee de Forest invented the ‘audion’ later called the triode, an improvement on the ‘Fleming Valve’ tube. In 1906 the American physicist Lee De Forest invented vacuum tube triode. It was the first three terminal device and enabled amplification and switching of electrical signals. Though it helped to push the development of technology a great deal, it had its own problems. The metal that emitted electrons in the vacuum tubes burned out. It occupied lot of space, consumed much power and produced heat. The first large-scale machines to take advantage of this transistor technology were early supercomputers – Stretch by IBM and LARC by Sperry-Rand. These machines were costly, however, and tended to be too powerful for the business sector’s computing needs, thereby limiting their attractiveness. A remarkable improvement realized in this generation was the development of assembly language. Assembly language was abbreviated programming codes to replace the machine language – the difficult binary codes. Towards the early 1960′s, there were a number of commercially successful second generation computers used in businesses, universities, and government. They contained all the components we associate with the modern day computer: printers, tape storage, disk storage, memory, and stored programs. One important example was the IBM 1401, which was universally accepted throughout industry. This is the first computer to enter into Nepal as well. Nepal brought this computer for the census of 2028 BS. It was the stored program and programming language that gave computers the flexibility to finally be cost effective and productive for business use. CLARIFICATION: The stored program concept means the instructions to run a computer for a specific function (known as a program) were held inside the computer’s memory, and could quickly be replaced by a different set of instructions for a different function. More sophisticated high-level languages such as COBOL (Common Business-Oriented Language) and FORTRAN (Formula Translator) came into common use during this time, and have expanded to the current day. Second generation computers used transistors as their main electronic component. Many people enjoy a misconception that all larger computers are from older generations and small computers are the fourth generation computers. Remember, computers are classified into different generations NOT based on their sizes. Though it is true that the old computers were compelled to be of bigger size (larger components and lack of advanced technology). The vacuum tubes used in first generation were replaced by transistors in second and which in turn were replaced by ICs (Integrated Circuits) in third generation computers. So, first of all, let’s look at those ICs. Please check R.C. Khanal’s ‘Computer Concept‘ book. He has nicely explained how these IC Chips are manufactured in ‘Computer Generations’ chapter. Notice the terms silicon, wafers, and photolithography. So, after the invention of IC Chips, it is possible to integrate thousands of registers, diodes, capacitors and many other electronic components and circuitry in a tiny chip. Integrated circuits are referred with different names like Chips, ICs, Microchips, and so on. A tiny chip contains the whole electronic network that performs complex tasks. The computers using small scale integration circuits (SSI)and medium scale integration circuits (MSI) are under this class. The invention of IC Chips made it possible to greatly reduce the size of computers with improvement in operation speed (nanoseconds) and reliability. The most noticeable achievement of third generation is the development of operatingsystems. The operating systems allowed the machines to run many different applications. These applications were monitored and coordinated by the computer’s memory. In 1969 AT&T Bell Laboratories programmers Kenneth Thompson and Dennis Ritchie developed the UNIXoperating system on a spare DEC minicomputer. UNIX was the first modern operating system that provided a sound intermediary between software and hardware. UNIX provided the user with the means to allocate resources on the fly, rather than requiring the resources be allocated in the design stages. The UNIX operating system quickly secured a wide following, particularly among engineers and scientists at universities and other computer science organizations. User interface devices such as Keyboards&Monitors started from this generation. Similarly, GUI also was started from third generation. These are important development of third generation. Third Generation Computers were based on integrated circuit (IC) technology. Users interacted with computers through keyboards and mouse rather than traditional punched cards and printers. Third Generation Computers devices consumed less power and generated less heat. In some cases, air conditioning was still required. Since hardware of the Third Generation Computers rarely failed, the maintenance cost was quite low. Extensive use of high-level language became possible in Third Generation Computers. Fourth generation for the computers is the era of blooming in multiple dimensions rather than invention of electronic components. Fourth generation computers use ICs as in third generation. But third generation computers used Small Scale and Medium Scale ICs where as in fourth generation Large Scale ICs (LSI), Very Large Scale ICs (VLSI) and the Ultra Large Scale ICs (ULSI) are used. As millions of electronic components got integrated in a tiny chip, the computers became very small with increased speed, reliability and reduction in cost. In this generation mini computers were built that had more user friendly software packages like word-processor and spreadsheet calculation. In 1981, IBM introduced its personal computer (PC) for use in the home, office and schools. Other companies made the clones of IBM PCs to make the personal computers more affordable. In 1984 Apple developed its Macintosh line. Notable for its user-friendly design, the Macintosh offered an operating system that allowed users to move screen icons instead of typing instructions. Users controlled the screen cursor using a mouse. Fourth generation is the duration when we saw the tremendous improvement in operating systems and high level programming language. As the small computers become powerful, it was possible to link and work in cooperative environment. This led to the invention of networking. WAN, MAN, LAN and PAN networks came into existence. In 1982 Japan started a project named Fifth Generation Computer Systems Project (FGCS) initiated to create a “fifth generation computer” which was supposed to perform much calculation using massive parallel processing. The project was to create the computer over a ten year period, after which it was considered ended and investment in a new, Sixth Generation project, began. Opinions about its outcome are divided: Either it was a failure, or it was ahead of its time. Anyway, it’s out of our context for the moment. I just wished to make you aware you of this fact. Fifth generation computers are anticipated new type of computer based on emerging microelectronic technologies with high computing speeds and parallel processing. Other major expectations out of this generation are the ability to use natural language and acquire artificial intelligence (AI). Computers will be able to learn by its experience. These computers are being made using ULSI (Ultra Large Scale IC) and Bio-Chips. We can see some development in achieving these features already. Parallel processing, voice recognition systems and some level of intelligence is been already realized. CLARIFICATION: Use natural language – computers will be able to understand and use the language that we use in speaking rather than the specially structured commands we are still using in computers. If you are looking for the examples of fifth generation computers, PIM/m, PIM/p, PIM/i, PIM/k, PIM/c are the names of fifth generation computers. An international conference in1962 divided the development of computers into five distinct generations based on main electronic component used on them. The computers that used vacuum tubes are first generation computers and they range the date 1946 to 1958. Vacuum tube diode was first developed by the English physicist Sir John Ambrose Fleming. Vacuum tube triode was invented in 1906 by the American engineer Lee De Forest. First generation computers were very large, consumed a lot of power producing excessive heat. They had low level of accuracy and reliability. Machine language was used to program first generation computers. Because thousands of vacuum tubes were used, they produced a lot of heat. Cooling facility was required in any room where computers were installed. Vacuum tubes were burnt out frequently andmaintenance cost was very high. This was the main drawback of first generation of computers. Second generation computers used transistors as their main electronic component. Transistorwas much smaller, produced almost no heat and thus, they had a tremendousimpact in development of computers and other electronic devices. Transistors were invented in 1947 by trio Bell Lab scientists – Walter Brattain, John Bardeen, and William Bradford Shockley. Assembly language was used to program second generation computers. Magnetic tapes and disks were used as main secondary storage media. Third generation computers were developed in 1965 to 1974 that used integrated circuits (ICs) also called microchip as main electronic component. Transistors were invented by two scientists independently in 1958 – Jack Kilby of Texas Instruments and Robert Noyce of Fairchild Semiconductor Corporation. Monitors and Keyboards were introduced in third generation for input and output of data. High level languages were use to program in third generation. Fourth generation computers are developed during 1975 to 1990 which used LSI and VLSI microprocessors. Invention of microprocessors is the most startling development in fourth generation. Personal Computers (PCs) were introduced and are very popular. GUI was developed in fourth generation. The first microprocessor called Intel 4004 was developed by American Intel Corporation in 1971. The fifth generation computer project conducted jointly by several Japanese computer manufacturers under the sponsorship of the Japanese government, emphasized artificial intelligence. Artificial intelligence is the branch of computer science concerned with designing intelligent computer system that possesses reasoning, learning and thinking capabilities resembling those of a human being. Fifth generation computers will use super conductor technology – Gallium Arsenide chips or Biochips. Quantum computation and nanotechnology will radically change the face of computers in years to come. you can answer any thing?